My life is so much easier when my pantry is stocked with healthy low GI foods. I just have to buy fresh produce, eggs, fish or meat and some other necessities which don’t have a long shelf life and I am done with my grocery shopping for almost a week. This means I always have ingredients on hand to prepare basic healthy recipes such as stews, soups, and salads. I also usually have enough stuff to quickly whip up a healthy dessert. Even breakfast on the run and healthy snacks are covered. 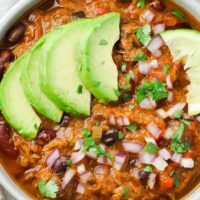 This is why I decided to put together this Low GI Pantry Staples Shopping List to help you create your own shopping list for a healthy low GI pantry. Just copy and paste the products into a word document (or into your favorite shopping list app), then add other grocery items you might need and your grocery list is ready. I did my best to include as many items as possible. This doesn’t mean I always have all of them on hand. I usually either rotate the items or just stick to my favorites. To avoid wasting food and money, never buy a big quantity of a product you haven’t tried before. First, purchase a small amount and make sure you like it and can use it in your cooking before the expiration date. 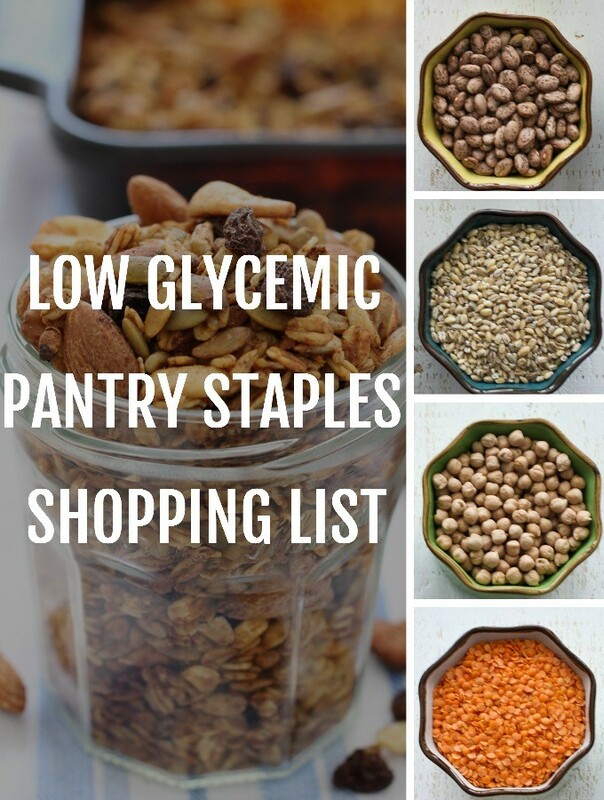 If you have a favorite low glycemic pantry staple you can’t live without, share it with us in the comments! 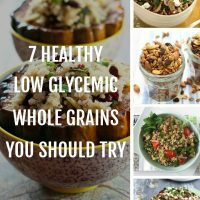 Keep in mind: No instant or quick cooking grains. Keep in mind: The below rice varieties have lower GI. Wild rice is the best, however, it can be quite expensive, so if you wish to cut the cost try mixing it with basmati rice or buy a pre-made wild/brown/long grain rice mix. Wild rice takes a long time to cook so it’s better to soak it overnight before cooking. Keep in mind: Dried beans usually have to be pre-soaked overnight before cooking so make sure to read the cooking instructions on the package. 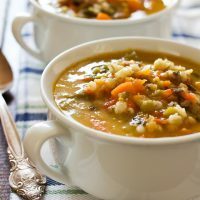 Lentils and split peas, on the other hand, are soft enough and will cook very quickly. Keep in mind: When shopping for canned goods, it’s better to buy the ones that come in BPA-free cans or in glass jars. Also, watch out for mystery ingredients, GMO, artificial colorings, and preservatives. Keep in mind: Homemade broth is always better. If you prefer a store bought kind make sure to buy broth without any strange ingredients such as artificial coloring or preservatives. You just want to see some veggies and spices on the ingredient list. Keep in mind: We are so used to baking with regular white flour that we completely forget that there are so many different types of flour available on the market. I would like to encourage you to experiment and find your favorite. Keep in mind: Seeds can be a great addition to your breakfast, salads, snacks and baked goods. Chia seeds are also used to thicken jams and puddings. Flax and chia can be used as an egg substitute in baking. Keep in mind: It’s better to buy raw unsalted nuts. It’s also a good idea to pre-soak nuts before consuming them to get rid of phytic acid. Keep in mind: Gone are the days when we believed that all fats were bad. Healthy oils and fats are awesome additions to the healthy diet. Olive oil and coconut oil are great for cooking. Flaxseed oil should never be heated and is used in salads. When buying any nut or seed butter make sure there is only one ingredient on the ingredient list which is the nut or seed listed on the label. Keep in mind: Herbs and spices add flavor and make cooking so much more fun. They are also full of super healthy nutrients. It took me some time to find spices and herbs that I like. I started by purchasing the spices I already knew how to use and then adding new ones. Spices can be expensive and they lose flavor as time goes by, so I don’t recommend buying them in large packages unless you are completely sure you are going to use a lot of it. Keep in mind: Similar to herbs and spices, condiments add a lot of flavor. Save money by preparing your own salad dressings using vinegar, olive oil, and dried herbs. Keep in mind: There is an ongoing debate about Stevia. Some people love it, others hate it. I personally don’t use it because I don’t like the aftertaste. 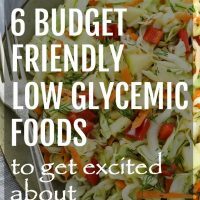 I included it in the list because it’s low GI and would like to encourage you to do your own research. Keep in mind: Dried fruits can be a great addition to low GI diet when used in moderation. 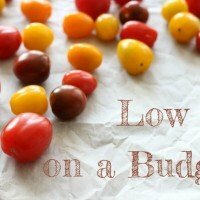 Dried berries are even better as they are low GI as long as they are sold unsweetened. Keep in mind: These items didn’t fit in any other categories so here they are grouped under “Extras”. Pasta is more of a medium glycemic item and should be always cooked al dente. Keep in mind: These items are not intended to replace regular healthy low GI meals. They are here to help you when you are in a hurry or just don’t have access to healthy low GI foods. Protein powders are not the same as meal replacement powders. Protein powder has to be mixed with carbohydrates in order to be consumed. Meal replacement powders contain protein, carbohydrates, vitamins and minerals, and sometimes even fat and only have to be mixed with water. When shopping for these items, make sure to choose the highest quality brand available to make sure you are getting a quality product without any contaminants.